Emily Everett knows what it's like to have a home away from home. Every year, she, her partner Dohn and two young daughters go camping at least three times, and always in the same spacious tent. "We have an Outwell Montana 6 tent, which is a large six-man tent that comes with all the extras," says Emily, 37, a teaching assistant from north London. 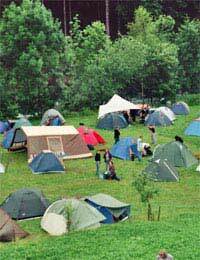 "You get different tiers of tents, and ours is a strong tent that will last a long time. It might be slightly pricer, but it will last for years. Camping is really kind of a science." Their tent, says Emily, comes with carpet and has two separate bedrooms that are so big you can stand up in them. There is an outside extension you can cook under, and you can stand outside underneath it when it's raining as well. "We like to camp because the kids absolutely love it, and it is very easy for us to do," she says, referring to daughters, Ysobel, five and Niamh, nine. "You always meet lots of other children, there is always a park, and the children are very free to do what they want, which is lovely. It's always a fantastic holiday for them, and we always know beforehand what the accommodation will be like!" Emily and her family tend to camp in different campsites round the country. "We do a lot of camping in Dorset, as there's a place near Swanage called Tom's Field which is really lovely, and very well-known for being family-friendly. "Also, every year we go to a place called Stiffkey in North Norfolk. The rest of the time I have a book we use to find good places to camp. We really try to get away as often as we can." That said, Emily says that camping is not as cheap as you might think, although it still works out to about half the price of renting a cottage. "You have to take into consideration all the food, drinks and outings, and campsites themselves are not that cheap anymore either," she says. "Also, few campsites in England have electricity hook-ups, although abroad they usually do. That means you have to buy fresh food every day, which makes it even more expensive." Emily and Dohn went camping in France before the kids were born, and they have booked two weeks this summer there as well. But as Emily will be seven months' pregnant come August, she doesn't know if she can manage sleeping in a tent this time around. "We are looking at houses with a swimming pool instead. Being pregnant, I'd really like a swimming pool and to sleep in a comfy bed. But we'll see what will happen." While the Everetts camp at least three times a year, they hire holiday houses quite often as well, says Emily. "We do one every January and we usually do an autumn one as well. And we try to do one in between, if we can. "We usually go with other people - in January my mum hires a house and we go and join her, so we pay the minimum. We hire one ourselves around Easter to have a kind of family time. "Then, in the summer we often go visit a friend in Ireland, and we hire a cottage there. It makes a difference from camping, although I cannot really say which one is better!"